UP aims to cultivate world-citizenship in its students. We see this in Vision 2020’s push to foreground opportunities and curricula that support internationalism, our robust study- abroad programs, the 69 Fulbrights students have won, as well as CISGO’s set of outcomes for Global and Intercultural Learning. Part of such student learning depends on faculty possessing a quantitatively accurate understanding of the modern world. Have you tested yourself lately? 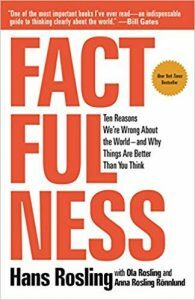 An enjoyable opportunity can be found in Hans Rosling’s 2018 book Factfulness: Ten Reasons We’re Wrong About the World – and Why Things are Better Than you Think – a book I devoured over spring break. 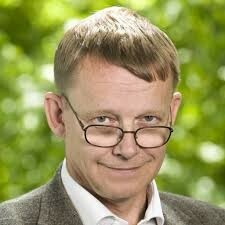 Rosling was a quirky Swedish TED-talk and global affairs speaker (one known to punctuate talks with displays of sword swallowing). He died from pancreatic cancer in 2017, just as he was finishing this career-capping overview of the true state of the world, as supported by numbers. Readers start the book confronted by a 13-question multiple-choice quiz on such things as how people are distributed across the planet’s continents, the amount poverty has decreased, rates of girls’ education, access to electricity, and global life expectancy. Sad to say, you and I will achieve a predictably bad score (as Rosling’s three decades of audience testing has determined) – a score likely worse than if we had merely guessed the answers. Most Westerners’ concept of the world, as Rosling explains, comes from a patchwork of outdated assumptions, unfamiliarity, media sentimentality, fear of the foreign, and a natural instinct for negativity. This leads us to operate with an “overdramatic worldview.” His solution is to cultivate a factful worldview – one based on numbers, proportions, and comparisons, gathered from across our planet’s 200+ countries. And so we learn that the majority of the world lives in middle-income countries (just 9% live in extreme poverty), 80% of humans have access to electricity, girls worldwide spend an average of 9 years in school (boys spend 10), and 80% of people around the world have had at least one vaccination (on this planet, anti-vaxxers are decidedly outnumbered). This is not a bunch of global trivia but rather the shaping of a worldview – one lit with possibility. Amid the good news, he prioritizes things we should worry about: global pandemics, financial collapse, world war, climate change, and extreme poverty. Along the way, Rosling reminds us of basic strategies for avoiding being fooled by data (e.g. getting proportionality with your information, avoiding urgency to maintain clear thinking, questioning categories). He presents helpful charts for visualizing the world and its (often confusing) data, and offers a concrete, four-level way to categorize countries by income (to replace the long-outdated “first/third-world” mode). While lies inevitably travel faster than facts, Rosling’s data helps fight the War on Error. In the right course, Factfulness would be an eye-opening inclusion. Knowing that in 2100, 80% of the population will most likely live in Asia and Africa would help our students keep their eye on the future’s true continental leaders (a recognition not given by most Western popular culture). Knowing that world population is not spiraling out of control would help calm fears. Recognizing how the past century has radically reduced global poverty and increased world health and safety would offer hope as we work on more intractable problems of our planet. And re-committing to truth would help keep us from bending it amid the panic of the day’s urgencies (as Rosling insists, “Data must be used to tell the truth, not to call to action, no matter how noble the intention”). Faculty can prepare the next several generations of global citizens by first ensuring our characteristically inaccurate and overdramatic worldviews are better tethered to Factfulness.